The challenge facing the NHS is one of the biggest since 1948, and the Five Year Forward View places new models-of-care at the heart of the solution. Bromley CCG and its local partners set out to make this a reality by introducing a radically different way of providing care for patients who are the biggest users of NHS services, to deliver better health outcomes, reduce avoidable hospital admissions and to do this at a lower cost. Bromley CCG identified a focus on proactive, coordinated and accessible care in an out-of-hospital setting could improve health outcomes, and asked IMPOWER to work in partnership to understand the pressures, and co-design innovative solutions with key stakeholders. 1) Local partners formally committed to deliver a new model-of-care, breaking down traditional ways of working and forming new partnerships. An agreement underpinned by a signed Memorandum of Understanding was co-developed with the CCG, which means Bromley is now ahead of many other areas trying to develop similar care models. 2) Proactive care will help patients live happier, healthier and more independent lives at home; They will play a central role in developing their own care plans. 3) Patients and carers will be empowered and actively-supported to better manage their own care, linked to a multi-disciplinary team of professionals and voluntary sector care navigators. Integrated care plans focussed on each individual, and key aspects of their wellbeing, not just their medical condition, which they have been central to developing; it might include social activity, exercise, mental health needs or tackling isolation. Day-to-day support from non-clinical care navigators who promote independence and are a key contact to help the individual navigate the health and care system and access appropriate non-medical services. Patient and carer education to encourage better self-management. Support from an integrated expert multi-disciplinary team (MDT) to ensure care is optimised, including mental health. Completing recruitment to new ICN roles. The first MDT meeting was on 18 October 2016 with more arranged from November through to September 2017. 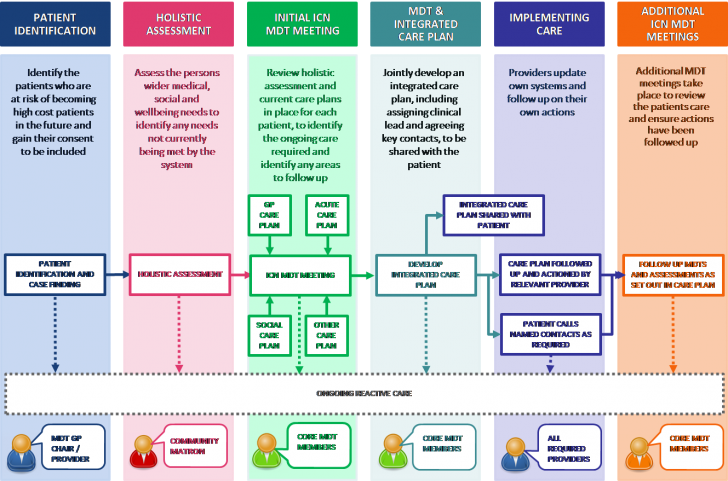 50 patients have already been referred, assessed and now have a new integrated care plan and the MDT are working with a further 50 patients. Gaps in patient care have been identified and actioned. Innovation is easy to say but harder to do, especially in a way that makes a difference for those who need the services the most. Bromley CCG, the local partners and IMPOWER have together built a new model-of-care that will transform lives. To discuss IMPOWER’s work in health please contact Vanessa Reeve at vreeve@impower.co.uk.